This monthly meme (:::note to self - rhymes with "cream":::) shows up on the third Thursday of the month. It's an opportunity to look back on the past month and see what you've been up to lately - and share it with blogdom. Stop by Christy's blog and check out her post, link up at the bottom, and read others' posts as well. Just plain fun! Lately, I've been working to finish reading this book so I can start this one. Lately, I've learned things about my biblical fiction main character that surprise me - and will make her story MUCH better. Lately, I've spent some quality time with the kids individually -and it's been nice. Lately, I've been reading The Chronicles of Narnia to my kids - and we've all loved it. Lately, I've learned ten billion things in a Margie Lawson online class. SO worth it! Lately, I've seen some positive results from persistence. Lately, I've thoroughly enjoyed taking walks in my neighborhood. Lately, my cat has developed a new nickname: Braticus the Caticus. Lately, I've been loving our adult Sunday School class on Israel and God's relationship with its people. Lately, I've appreciated my husband more and more. So, tell me: what have YOU been doing as of late? 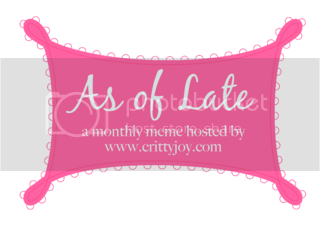 Link up at Christy's blog to participate - or just stop by to read other folks' posts. Okay the cat's nickname made me literally laugh out loud! Too funny! Yay for all the writing things going on in your life. It's a beautiful thing dear! And oh the amazingness of reading the Chronicles of Narnia. Sometimes I wish I had someone to read it aloud too (hmmm. When Toccoa is older....) I think it would give me a different perspective to the stories I have enjoyed so much. Sounds like you have been quite busy lately. Love this meme idea -- it is so creative and leads to some fabulous posts! Love the cat and it's name. Braticus the Caticus! Love it!! Love your list, but that one still has me laughing.